What is mankind’s greatest concern today? Is it the spread of terrorism, the rising tide of Islam and the possibility of global conflict? Is it the fear of recession, the might of Russia, the burgeoning Chinese economy? Is global warming, with other associated changes in the physical state of the planet, the greatest threat? 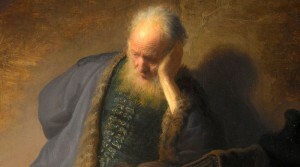 Or will the end of civilisation (if man were left to himself) be brought about by AIDS, shortages of food, and poverty? It is a frightening list, and no wonder that in the time of the end men’s hearts shall be “failing them for fear, and for looking after those things which are coming on the earth” (Luke 21:26). There is, however, another cause of alarm, not directly mentioned in the foregoing, and largely ignored. It is the steeply rising population of the world. 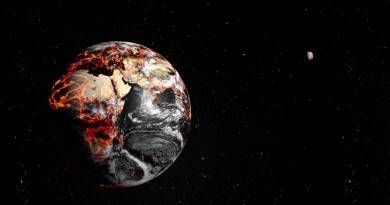 Though world leaders seem reluctant to acknowledge the fact, mankind is in the midst of a population explosion and, as a result, is hurtling towards the greatest disaster in human history. In the 1960s, the world’s population stood at around 3.25 billion, and at that time politicians were concerned about “the population time bomb”. Today it no longer hits the headlines. Not that the problem has been solved: on the contrary, the figure has meanwhile doubled, and it is still growing. Most world leaders, in fact, want a return to bigger families, because that is “good for the economy”. Any assessment of the population problem needs to be put into perspective. For most of the world’s history (see Figure 1), the human race could be counted in tens or hundreds of millions, and most people lived in the Middle East, India and China. Population generally increased in the course of time, but at a rate of less than 0.1% per annum; accordingly, the doubling-time for the world population was about once every 1,000 years. 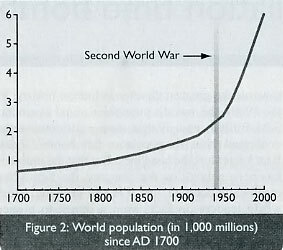 `Population explosions’ have been extremely rare, because growth was almost always limited by war or famine. 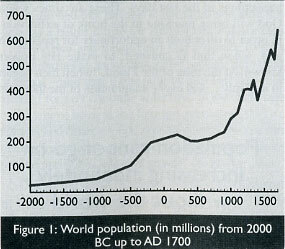 There was, however, one period when growth increased much more rapidly, and the population doubled in 500 years. This was at the height of the Roman Empire, and the explanation is to be found in the unique conditions of the period. In an agricultural community, people are dependent for their food on the productivity of the land close to where they live: the extent and fertility of that land limits the amount of food that can be produced and therefore dictates whether, and how rapidly, the population can grow. In the Roman Empire, possibly for the first time in history, the growth of population in a particular area was no longer limited by the availability of food that could be grown locally. Grain was grown throughout the empire, notably in Egypt, and conveyed in ships to the homeland. Labour previously required for agriculture could thus be released and used for other purposes, and with an assured food supply the population grew without restraint. This situation came to an end with the fall of the empire, and then the more normal direct relationship between local agriculture and population size resumed. At the start of the Christian era, world population stood at 200 million and growth continued at a slower pace – with fluctuations in the Middle Ages due to disease epidemics – until the industrial era. Then, once again, there was a sudden and very steep acceleration (see Figure 2). By 1970, growth reached a peak of 2% per annum – equivalent to a doubling every thirty-five years. Since then, as a consequence of AIDS and other modern counterparts of the medieval plagues, growth has declined to 1.5% and a doubling-time of ‘only’ forty-five to fifty years –yet still ten times the rate of increase at the height of the Roman Empire! The cause of the sudden increase during the industrial revolution was different from that which operated during the Roman Empire, but the effect was similar. Food could be grown and distributed much more efficiently with the help of machinery; and in the twentieth century, the use of fertilisers and pesticides further enhanced the productivity of the land. Countries in the West, at least, became affluent, and improvements in health led to a reduction in infant mortality, an increase in longevity and population growth. But population cannot go on increasing indefinitely without the world becoming unstable. That is our current situation, made worse, moreover, by changes in climate arising from global warming. Shortages of food and water, and lack of work, are leading to spiralling numbers of ‘economic migrants’ – refugees from poorer areas looking for a better life in affluent Europe and elsewhere. Another consequence is that today’s workforce is having to support an increasing proportion of older people. As the world’s population rises to an expected 10 billion in c.2035-2040, tensions are bound to rise, and it is not hard to foresee circumstances leading initially to local conflicts and ultimately to global war. We began with a list of developments often cited in connection with signs of the latter days –terrorism, AIDS, famine, the rise of Russia, the commercial dominance of China etc. 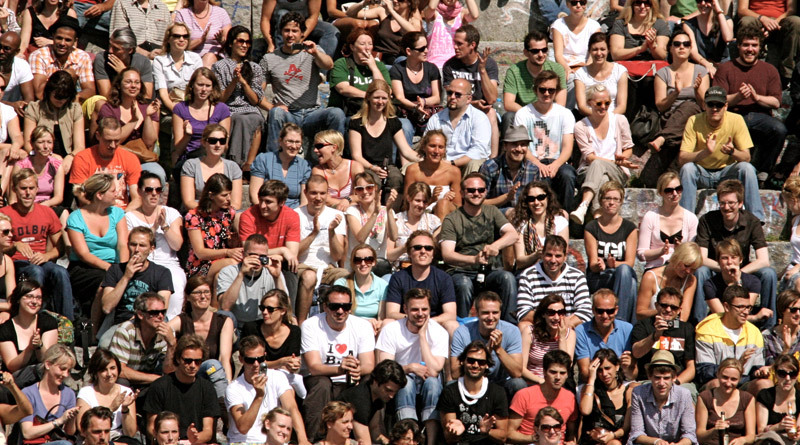 The unprecedented increase in the world’s population is an alarming development alongside all of these other trends; indeed it can be a cause or consequence of them. It is a time bomb, ready to explode. We are surely not surprised at such dramatic happenings in the last days. These are times when God will bring mankind to the brink of extinction, in order to offer both an opportunity for repentance and, when that is spurned, to make His power known. At the time of the Flood, “when men began to multiply … and every imagination of the thoughts of his heart was only evil continually” (Genesis 6:1,5), God intervened. The Lord Jesus Christ, referring back to the days of Noah, prophesied of the times in which we live: “So shall also the coming of the Son of man be” (Matthew 24:37-39).